Carnival Games are a Lotza Party specialty. Here you'll find the best in selection and quality in our quality carnival games. You can turn any area of your event into "Carnival Midway", just like at the State Fair. Browse the game selection below for just the right games for your event. 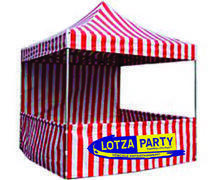 Base Price is shown for inflatable game & carnival tent rental up to 4 hours long. Price is AUTOMATICALY increased by $50 for inflatable game & carnival tent rentals 5-8 hours long. The max rental time on inflatable games & carnival tents is 8 hours unless another time was agreed upon by our sales manager. Thanks, your friends at Lotza Party.